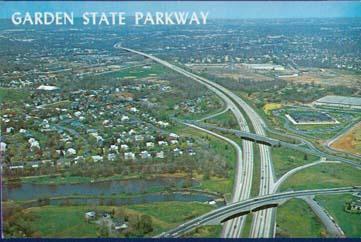 Murky Memories: I think my relatives helped build the Parkway. I’m definitely murky about that. What I do remember is being born at Exit 130. Driving at least once a week to my grandparents house at exit 140. Marvelling at the overall design of the road, paying tolls, visiting the “rest stops” in the middle of the northbound and southbound lanes. And above all else, I remember the rumble. It’s not that way anymore, but I remember the Parkway being kind of a yellow cement with stone mixed in, as opposed to the traditional black asphalt that it and most highways are now. When your car would pass over it at 65 (then lowered to 55 for some time) you would hear a constant rumble like when you drive on the shoulder of a modern highway. Strange. I remember the Parkway being overly congested in my youth as we drove to Wildwood, and I remember more recently getting stuck in traffic up in Bergen County or by the Woodbridge interchange. Still, the legacy of the Parkway is best described by the old comedian joke “Oh, you’re from New Jersey, what exit?” That joke is a direct reference to the Parkway’s exits. *Sigh* I could go on, but the memories are just too murky to do them justice.